In retrospect, I really should have had the rats dropping out of the air ducts. Session 4, 139-1105. Yes, I established the date. The Travellers in the as yet unnamed Lab Ship come out of jump space a bit further out than expected from Iac. Alarms are blaring and there is an automated distress signal from a ship at close range. Apparently in a surprisingly strange coincidence, another ship had come out of jump far too close at about the same time. This was a Cytec ship and was tumbling in an out of control manner. We were missing three players this time, so this was a fortuitous happenstance. While the characters of the players not present stayed on board the Lab Ship, three of our characters were to go across to the tumbling ship. The pilot Sir Max, managed to overshoot the ship initially but came around on the second pass. Iac port was sending up two emergency response ships, but even at 6G they were an hour away. As Lt. Oeg had an air/raft, and the shuttle was too large to fit in the airlock of the Axion class cargo craft, the Lt piloted the craft over to the drifting and rotating craft. Osrum did manage to not throw up, but did get ejected from his seat during the maneuvers. It was either Qat or Max who dragged him back in. They went through the top port, which is a grav chute through the entire four deck craft. The top deck presented what appeared to be normal, and empty, staterooms. The next deck presented the bridge deck, which was locked. There was a constant flashing of red warning lights as well a low siren. Out of the corners of their eyes, Qat and Osrum both noticed something that skittered behind them as they were working on the door. Sir Max recognized the interface as a VR interface, and with his TL 15 Scout suit, managed to unlock the door. 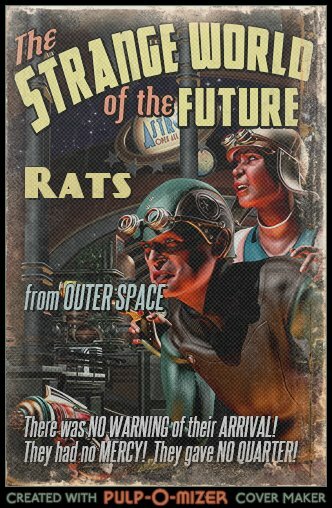 And they then saw the space rats! Of course, 1 rate vs a VRF Gauss gun does not stand much of a chance, and fortunately Max killed it with the single shot. A gauss round in a starship is generally not a good idea. And despite the alarms going off, apparently the ship roombas still worked as the rat's remains were rapidly cleaned up and removed. Still wearing their suits, worried about it being a plague ship, they found that there were several engineering warnings. And as spacers, they knew that an infestation of these rats easily leads to chewed wires, conduits and other ship-wide damages. They also found that the ship had placed the entire crew into emergency sleep mode, something very similar to the Borg regeneration. The Cytec branch of humanity are trying to move to the singularity and represent a fringe trans-humanist ideal. Waking the captain, who came to the bridge and turned off the alarms, they found the various nests via internal ship sensors. They flooded the cargo bay with the anti-fire retardant which killed the vast majority. While they thought about opening the cargo bay doors, the ship crew quarters were on the 2nd deck of the cargo area, and their doors were not air-tight. While Sir Max and Captain Sally went to the engineering section to repair the damage as best they could, Qat and Osrum went rat hunting with stunners and a crow bar. It was short work to get the remaining two groups, and the ship had basic repairs done and managed to stop spinning. By this time, the emergency crews had caught up, and we left the session with all the ships heading to Iac. Which means I need to detail Iac a bit more as I did not expect them to actually visit much. But it will also give us a chance to the last player into the game - he missed the first few sessions and we need to get him introduced in there. Captain Sally will also being gifting the lab ship crew with some of her cargo in thanks. I need to figure out what that ship may be carrying as well.